Former Stone Roses bassist Mani has urged erstwhile bandmates Ian Brown and John Squire to "kiss and make up" and reform the band. He also claimed that the constant bickering between the two had become "boring". 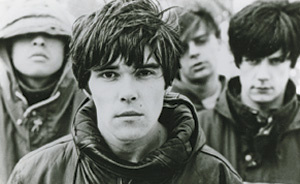 Talking to BBC 6 Music on the 20th anniversary of the release of the band's eponymous debut record, Mani said: "We won't be celebrating the release of the record as a unit because unfortunately Ian [Brown] and John [Squire] still aren't talking. "It's getting very boring that one now isn't it?" Mani told BBC 6 Music. "I don't know why they don't kiss and make up."